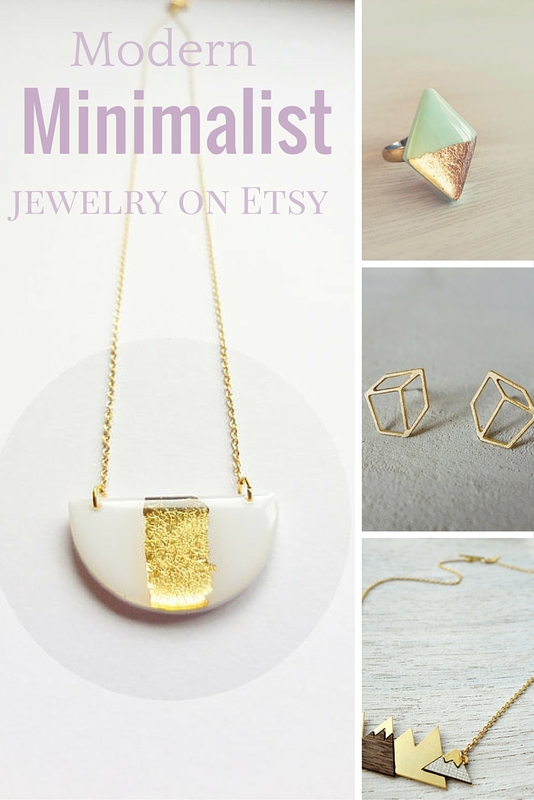 Here is a handy curated collection of my favorite minimalist jewelry designers and shops on Etsy, specializing in jewelry with modern, minimalist design with a bit of geometric, Scandinavian flair thrown in. I love jewelry that is bold in its shapes and forms but is free from to much embellishments and frills. Shopping on Etsy is great for many reasons, one being that you get truly unique, original pieces that let you stand out from the crowd, while supporting independent artisans at the same time. Another plus is that these gems won’t break the bank, so you can afford to buy these just for everyday use. P.S. I am not an Etsy affiliate, just a lover of all things artisanal! LamFaTiTa makes really beautiful modern earrings and necklaces that have gold foil accents, adding just the right amount of shine and sparkle without being too bling-bling. Love the pastel shades that are not too childlike. HannahRun does the origami style jewelry trend well, with a nice feminine touch and cute animal designs. Lovelovelove the T-Rex earrings! Lunahoo is the shop to visit if you like tiny jewelry with clean and minimalist design. Those fluttering heart studs are so pretty! Shlomitofir rocks the geometric jewelry trend and brings some cool dimensions to her designs. A bit more expensive but the details of these are amazing. Aaprill is a colorful jewelry shop with a bit more whimsical designs and some really great examples of the super dainty, tiny and feminine trend. DanaJewellery is a really quite unique, as all of their jewelry designs are made of upcycled old vinyl records. A nice conversation starter – I bet no one will guess correctly what these modern gems are made of. I hope you found something you liked, please visit the comments below to share your favorite!